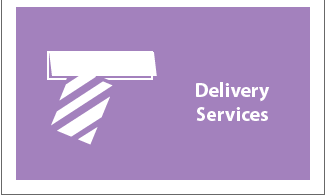 How do I know my leaflets will actually be delivered? 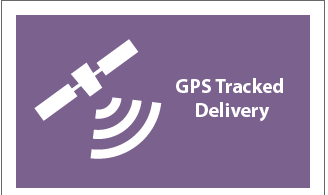 With our GPS tracked leaflet delivery, you will be left in no doubt that your leaflets have been delivered. We use an exceptionally reliable and trustworthy adult distribution work force that is paid above the minimum wage. Upon recruitment, our distributors are required to complete a minimum period distributing our own promotional flyers which is checked and verified in the same way that we check and verify the paperwork for our clients’ rounds. It is only upon completion of this “probationary period” that we allow distributors to start delivering our clients’ material. This ensures we only take on people who can carry out the job reliably. We track all our distribution using GPS tracking devices. On the long driveways you can see the route of the distributor deviating up to each letterbox! See an example on our leaflet distribution GPS tracking page. Our distribution co-ordinators check the data that is downloaded from the trackers from each distributor and you will receive a report of your GPS tracked distribution showing the exact route that the distributors took to deliver your leaflets. Depending on the delivery option you choose, your leaflet will be distributed with 1, 2 or 3 other flyers. One of these flyers may include a Shareplan delivery audit flyer insert we include as part of our response checking system. Your leaflet will not be distributed with a competing company’s material on any of our services and it will never be with more than 3 other pieces of material. Because of our matching process, our rates are very competitive and you can find a summary of our services on our Delivery Options Page. If you have any specific requirements that are outside our standard service, please feel free to contact us to discuss it with one of our advisors. We will be happy to quote you a special price. We do try to accommodate your requests wherever possible. Please consider other factors that may affect price include bulky or heavier items, time sensitive items and some areas outside the main coverage area. Please note that ALL leaflet distribution is GPS tracked which is included in the price quoted. Get a FREE quote now. Payment must be made prior to the start of your leaflet distribution. 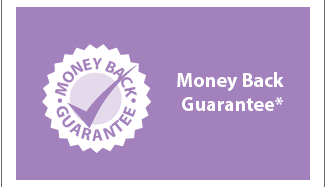 We accept cash, cheques or bank transfer only. Credit and debit cards are not accepted. Can I choose which area my leaflets will be delivered to? Absolutely. You decide which areas within our Coverage Area you would like to target with your leaflets and when the leaflets go out*. If you choose either the Matched Plus One or the Solus option, you have the option to either supply us with your chosen postcode or supply us with a map. We can advise you of the number of homes contained within specific areas to help you plan your distribution. With our experience and knowledge, we can help you maximise the success you achieve from your GPS tracked leaflet delivery campaign, so please ask if you would like advice. You have the choice from our Standard Maps only on the Plus 2 and Plus 3 options. 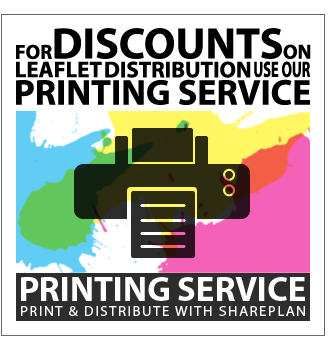 Shareplan Leaflet Distribution can not imply or guarantee any response to your material. Response levels are dependent on various factors including your message, the demographic you target and the product or service you are offering. However, we do offer a FREE marketing consultation to give you advice on flyer design and targeting to help you maximise the profits from your campaign. 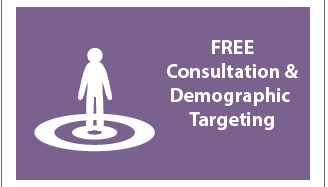 Call us now to book your FREE one-to-one marketing consultation. We are able to deliver a wide range of advertising materials, from A5 leaflets to a multi page brochure. Whatever your item, give us a call and we will be happy to give you a quote. Can you design and/or print my flyer? We are pleased to say that we now offer both of these services. Our printing rates are incredibly competitive and you could even qualify for a discount on your distribution if you use us for both printing and distribution for your campaign. In general, we request receipt of your leaflets and payment 7 days prior to the commencement of your drop. The leaflets are then scheduled on our system ready for allocation to our team of distributors. Your distribution timeframe will depend on the service you opt for. Solus & Matched (plus 1) are normally delivered over a 2/3* week distribution period. Shareplan (plus 2) is delivered over a 3/4* week distribution period and Shareplan (Plus 3) is delivered over a 4/5 week* distribution period. If you are in a hurry to distribute the flyers, we may be able to allocate the flyers on a shorter timescale depending on how busy we are although there may be a surcharge for very time sensitive requests. Will you collect my material from me? We request that you deliver your material to us 7-10 days prior to commencement of your drop. We do offer a collection service for an additional nominal charge. * With Shareplan Leaflet Distribution standard maps are included in the Shareplan (Plus 2) or (Plus 3) Options. 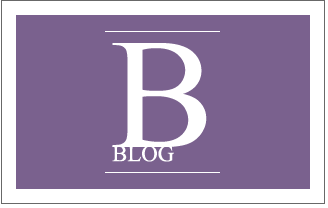 ** Although we generally don’t have long lead times for booking distribution, it is always advisable to plan your campaigns as far in advance as possible. Our lead times can change in very busy periods and from time to time, it may be necessary to quote you a longer distribution period than normal.